Do you know that more than 45% positions of medical billing representatives are given to the candidates from non-medical backgrounds? However, the interesting thing is that they perform the job duties excellently. The major reason is more focus of recruiters on communication skills of candidates rather than medical knowledge. In actual, there is no use of having such kind of knowledge for this position. You can even apply for this job by having a degree in business administration. Your profile picture and headline are two of the most important and most viewed elements of your profile. Consider editing your headline to give a better understanding of what you are seeking. Instead of ‘Actively Seeking Employment’, you could update your headline to say ‘Experienced Administrative/Customer Service/Medical Billing Representative Seeking Position’. Overall, your summary section does a great job in describing your background. Review this and your entire profile for spelling and formatting issues. In your second paragraph, you say ‘further yourself within the company you with’ although it should read ‘company you are with’. When you list your specialties, the second entry is ‘benefits admini’ and may need to be adjusted to ‘benefits administrator’ Consider attaching your resume to this section. This will allow recruiters and future employers to learn more about you as they view your profile. 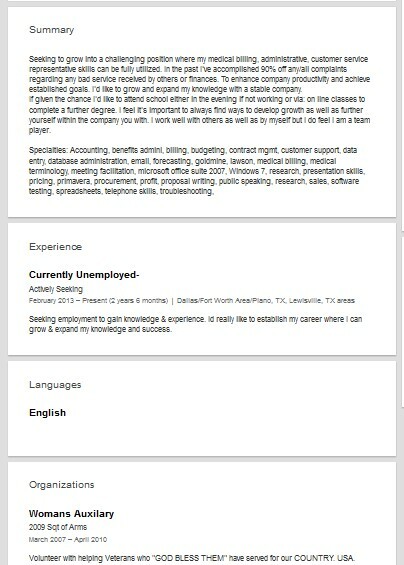 You might be also interested in our PC support technician Linkedin profile review. The photo is the major element of your LinkedIn profile. You can’t end up in leaving the photo’s section empty or by uploading any other picture. More connections would help you out in developing best chances of work. Build more connections. The mistakes of grammar are not allowed to be made in the profile. Spelling mistakes need to be rectified rather than considering mere creating profile a big achievement. Create your blog, make YouTube videos or do something on social media that can help in appealing the readers. Build many connections to get the best opportunities. This is how you can be able to land ideal jobs. 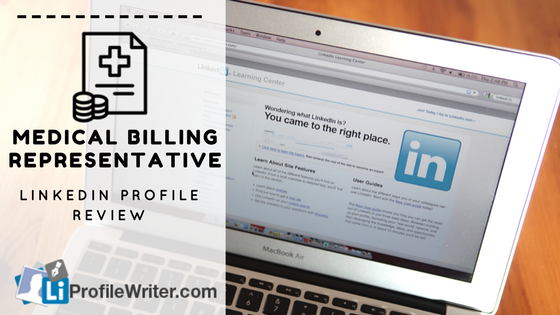 Check out the profiles of professionals or experienced medical billing representatives for having an idea. Don’t imitate the style of writing. Try to express yourself in a unique way. People who join groups on LinkedIn are likely to get jobs rather than others. Mention all the professional achievements and accomplishment along with the skills. According to Albert Einstein, “Strive not to be a success, but rather to be part of value”. Another important quote from an expert is “Rise up fresh, See the bright opportunity in each new day”. These quotes show that you don’t need to lose hope. After creating the profile of LinkedIn, it is recommended to get some help by viewing the other related profiles. Never create any mess and write everything by paying full focus accordingly. Start by reading the added info and recheck their source to ensure either it is right or not. It is better to pay attention to the summary’s section. The employers read summary and work experience section of the LinkedIn profile. 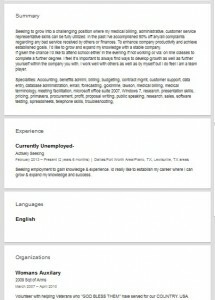 Check that all the included info is similar with the added info of resume. Compare the details. This can help to show your credibility in front of employers who check LinkedIn profile either by seeing your resume or check resume by calling you post checking profile. Make sure that the style of writing is same till the last word. This actually shows the dedication of any professional. Choose welcoming conversation style.